Miami has many attractions — its beach and nightlife are legendary. 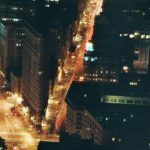 But the city has a thriving design district that is a major draw, whether you’re interested in luxury clothes, shoes and accessories, or high-end design for your home. 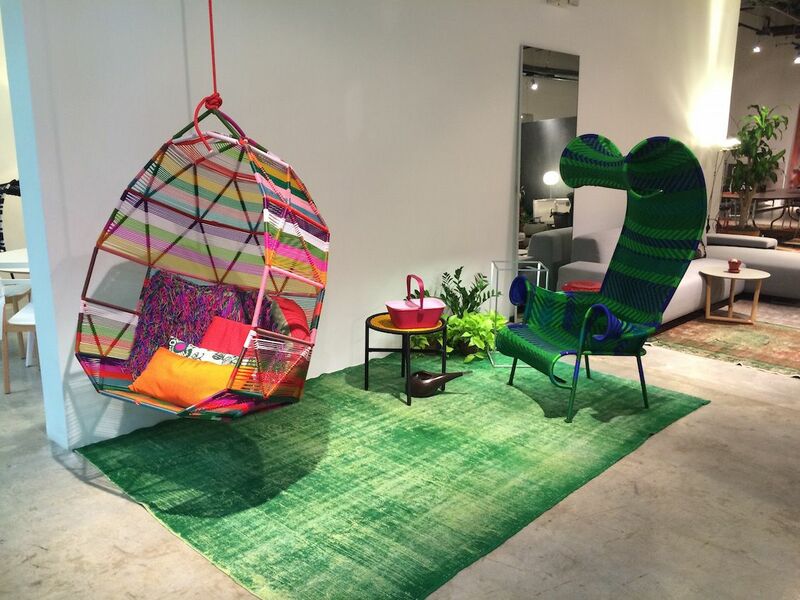 I just spent a few days in the Miami Design District, perusing the amazing offerings by major home brands and boutique designers. It’s a treat for the senses, both inside and out. It’s also still evolving, with many improvements and additions underway. 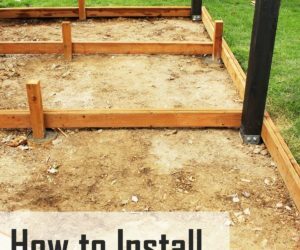 According to the website, the district will soon include public art installations like the . This section of Miami is part of midtown and will eventually encompass 21 acres. Right now, the most bustling part is a six- to eight-block area filled with high-end merchants and restaurants. It began to take shape about 15 years ago when developer envisioned the potential and began buying up land, and now lures luxury retailers like Pucci, Louis Vuitton, Mui Mui and Cartier. Well-known potter and designer store is a mod treat. From tongue-in-cheek canisters for your secrets and white lies, to Sputnik lighting of all sizes, there’s something for everyone. Most fun were all the accessories. 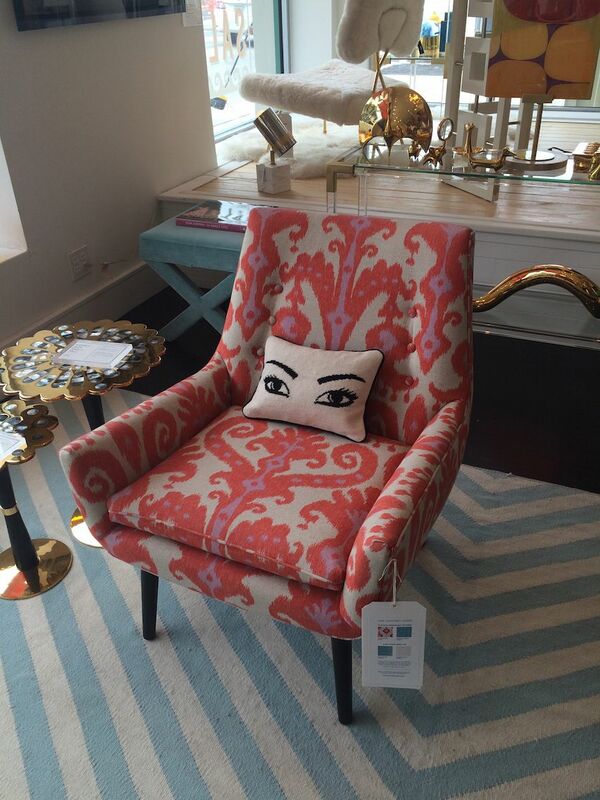 This cute needlepoint pillow is an unexpected accent to his Mrs. Godfrey chair. 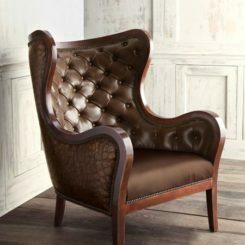 It is upholstered in an ikat-like fabric in Marrakech coral.The legs are done in Wenge. These glowing orbs on the table caught my eye from way across the store. 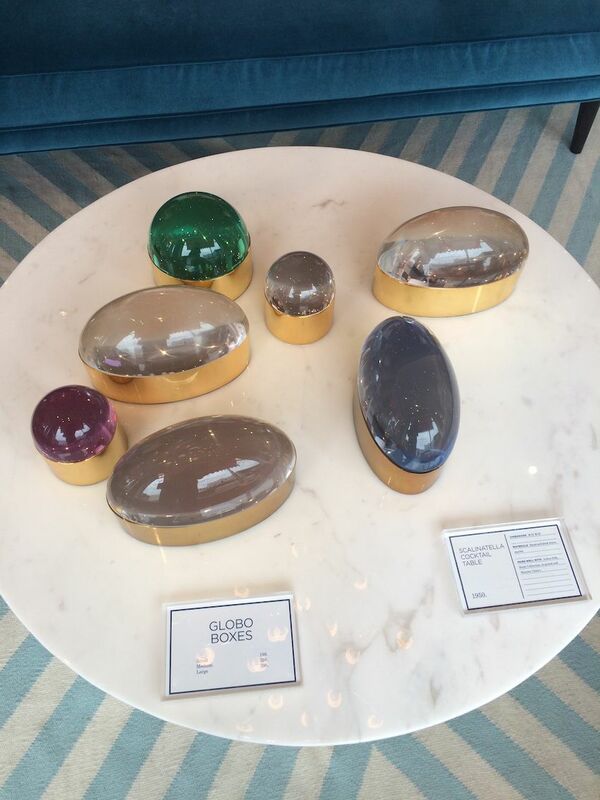 Luminous and luxe, the Globo boxes are just stunning. 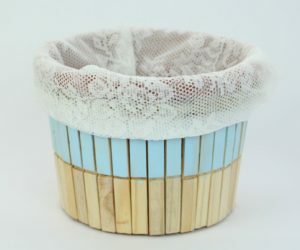 Perfect for any room, they can hide away little stashes of just about anything, thanks to a removable cup liner that can be washed. Love animals? Me too! 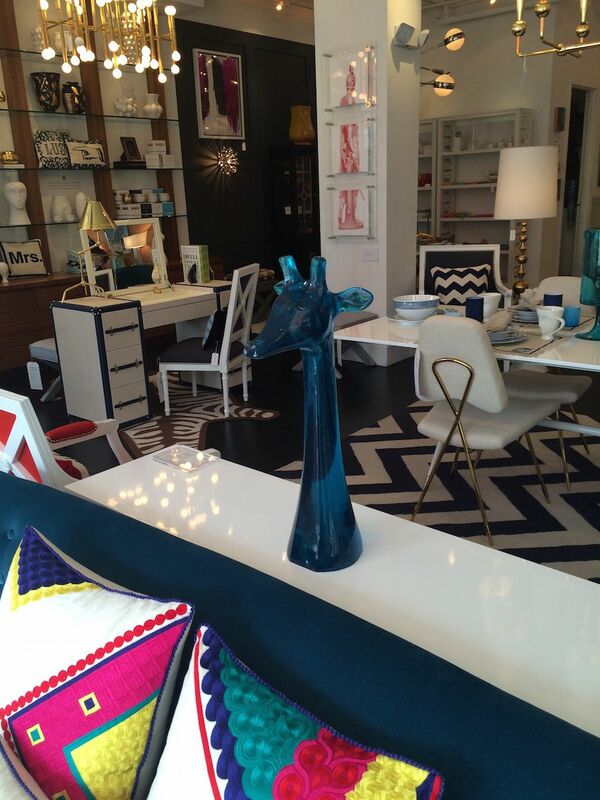 Right now some of Adler’s hottest accessories are animal shapes, like this adorable lucite giraffe. 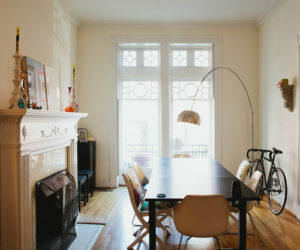 The are made in Adler’s Soho pottery studio, where ceramicists hand sculpt the animal model and then cast in in lucite. 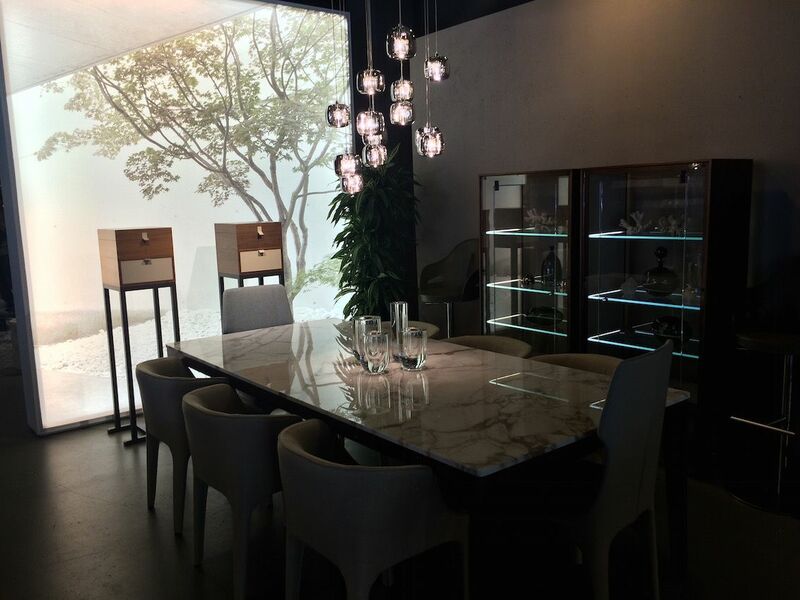 I walked directly into the sleek showroom of this Brazilian company, drawn in by the clean modern designs I could see through the window. is an ultra-luxury brand and it shows in the stunning closet, kitchen and bath collections. It might be not be familiar to much of the American market, but in Brazil it’s a famous brand. 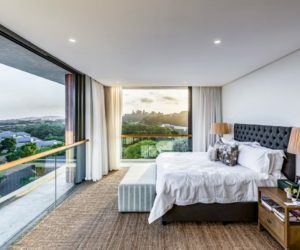 The design associate explained to me that the focus of the brand is a promoting a high quality of life to its customers through unique products that are high quality and high tech. 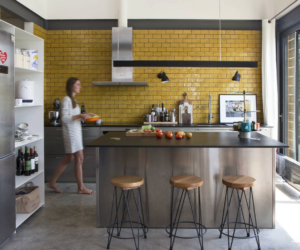 This amazing kitchen is by designer Guto Indio Da Costa. 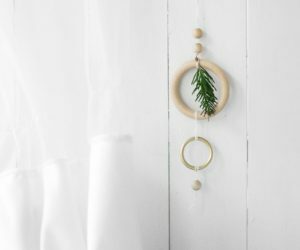 The clean minimalist design is a breath of fresh air. 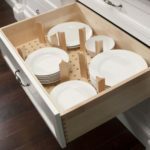 Ornare has a variety of customizable closet systems that use interesting materials, such as leather or a breathable mesh for the doors.They’re all dream closets that could keep just about anyone organized. 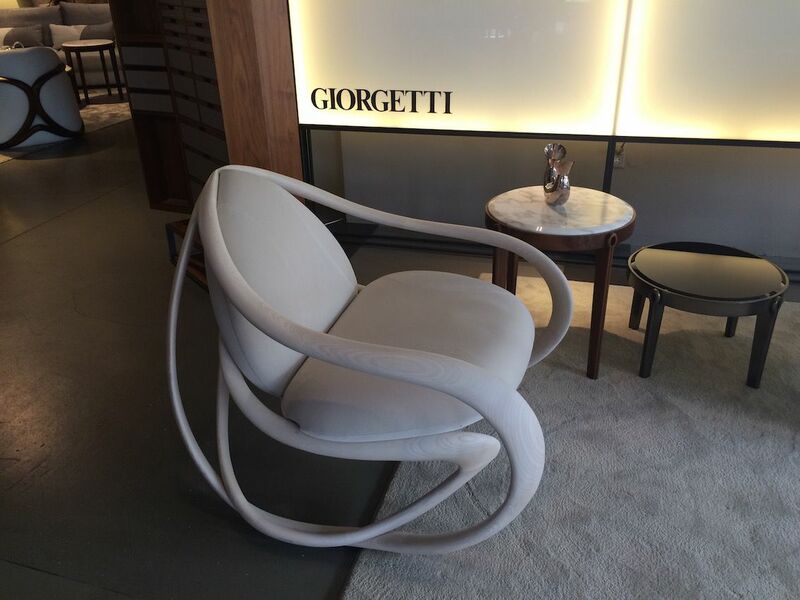 There are some really mazing pieces in the showroom, which carries high end designs from some of the top Italian designers in the furniture industry such as Molenti & C, Dada, ARMANI / Dada, and Terzani. 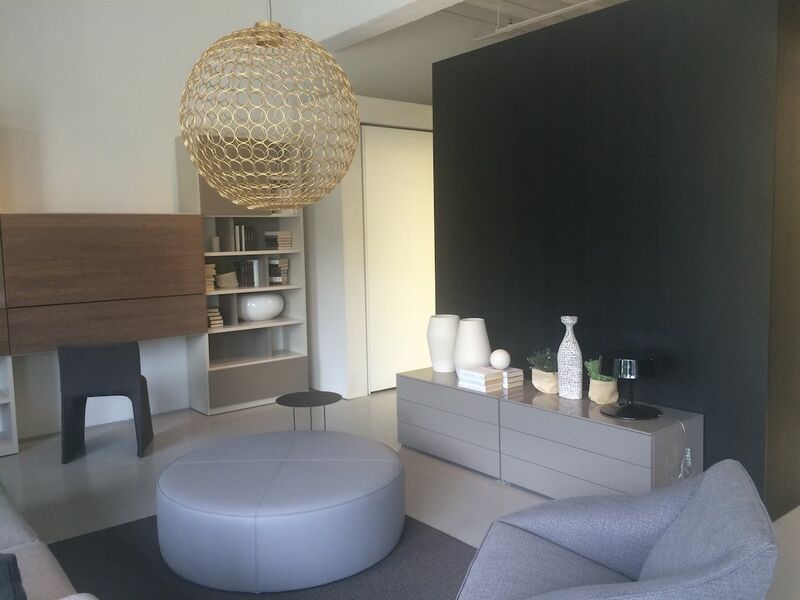 This luxe and modern setting includes the Domino Pouf in leather and the Doda armchair, both by Molten & C. Either one of these pieces could easily fit into just about any style of living space. 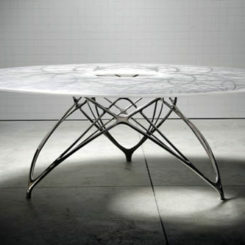 We’re in love with this Teso table by Molten. It’s a large round table but the glass top and airy base keep it from being overwhelming. 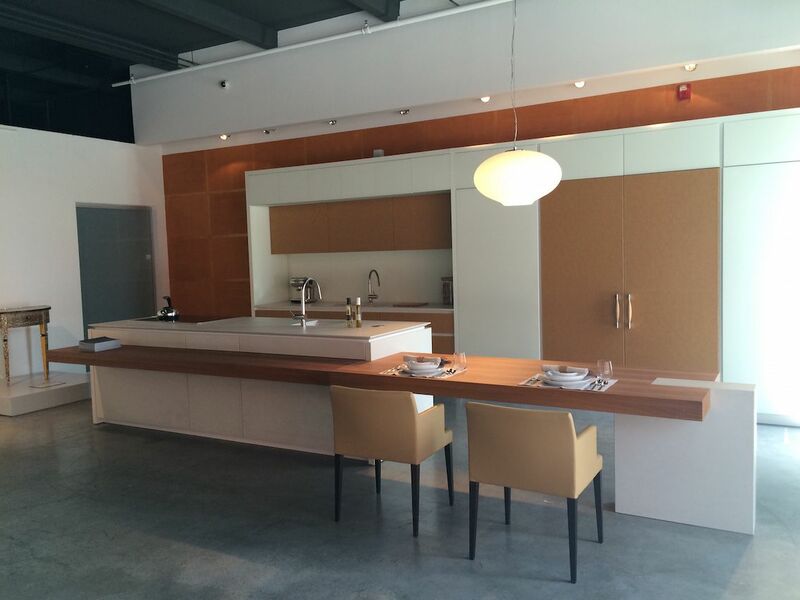 The Modus Miami showroom also has a number of kitchens. 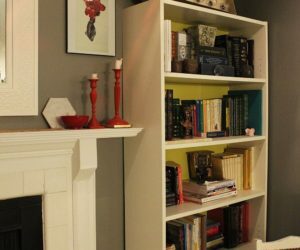 closets and other room settings that are very inspiring. Quite different from its neighbor but no less appealing is . 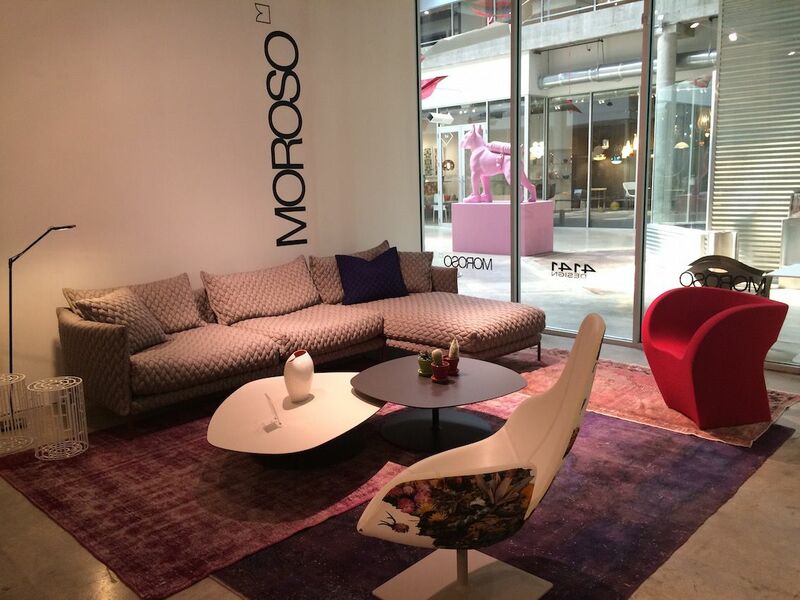 I could easily have browsed this amazing design store for hours because there are so many fascinating pieces. The shop, whose name means “create your own path” in Malay, houses both locally and globally sourced works of furniture, accessories, bedding and art. The collection really spans the globe! 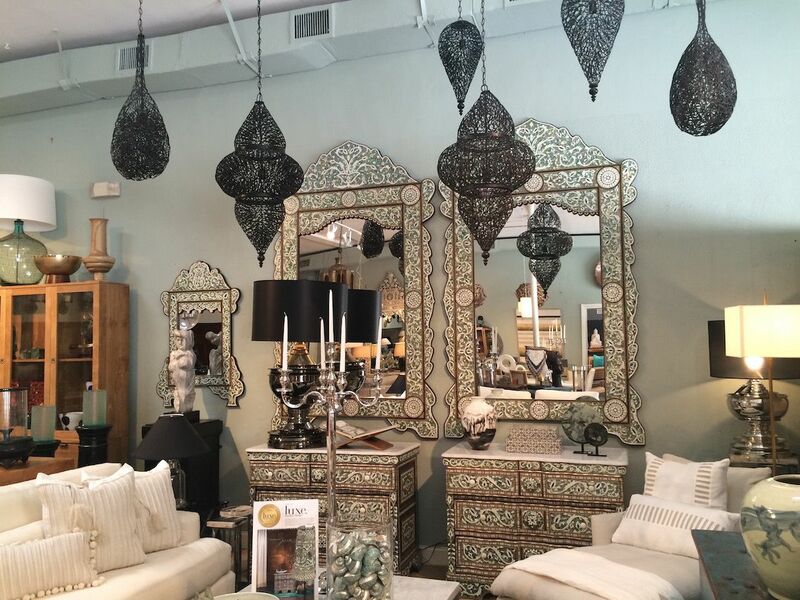 Moroccan lanterns highlight the amazing pearl inlay of the cabinets and mirrors. These would be the outstanding highlight of any decor. 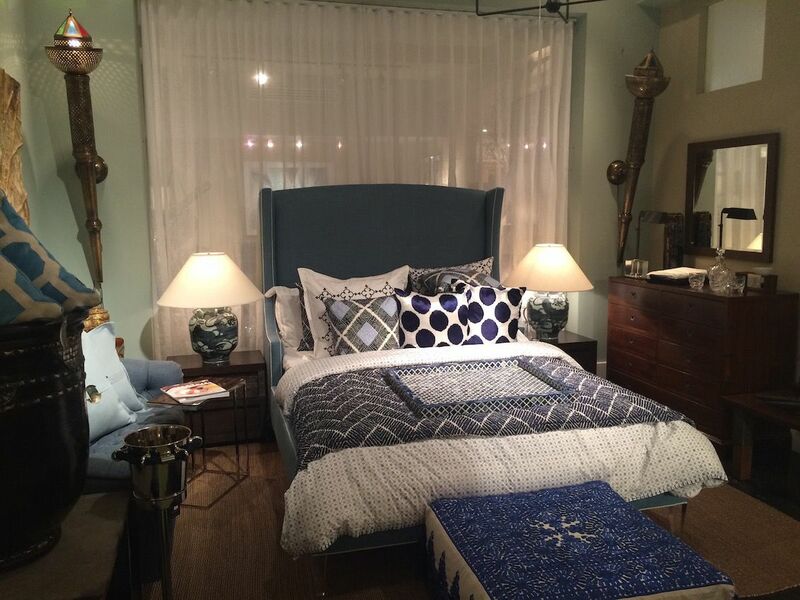 I was quite taken with this blue bedroom ensemble that features a leather upholstered Wing bed. The juxtaposition of ethnic textiles and accessories like the Moroccan embroidered footstool in a range of complementary blues that aren’t too “matchy-matchy” are really great. 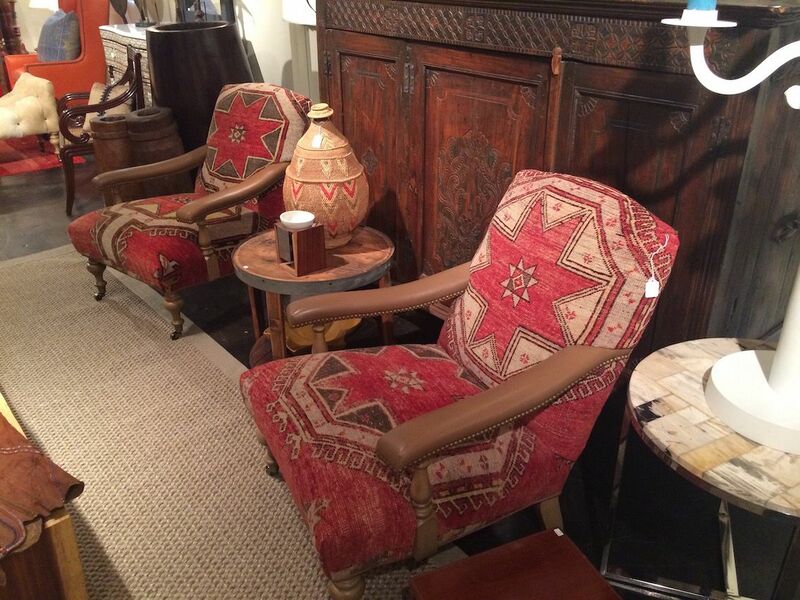 These chairs upholstered in kilim-style rugs with leather armrests would look great in either a modern space or paired with traditional furnishings. 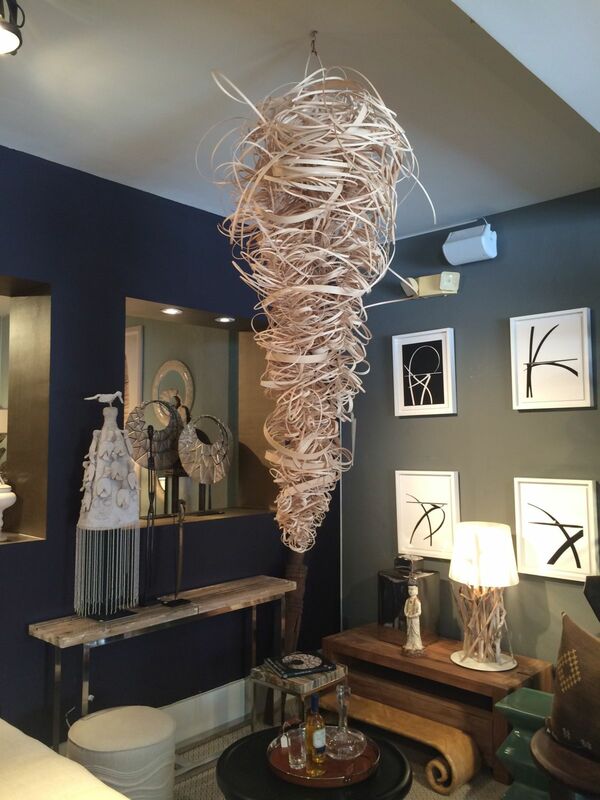 Just one example of some of the innovative art in the store is this hanging piece titled “Chaos” by Ran Adler. It’s made from wood curls that are collected from basket weavers’ cast-offs and hand strung into art pieces. Such a conversation starter! 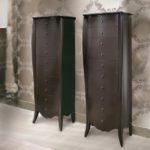 is another shop where you could easily spend hours perusing the beautiful contemporary and modern furniture and accessories. 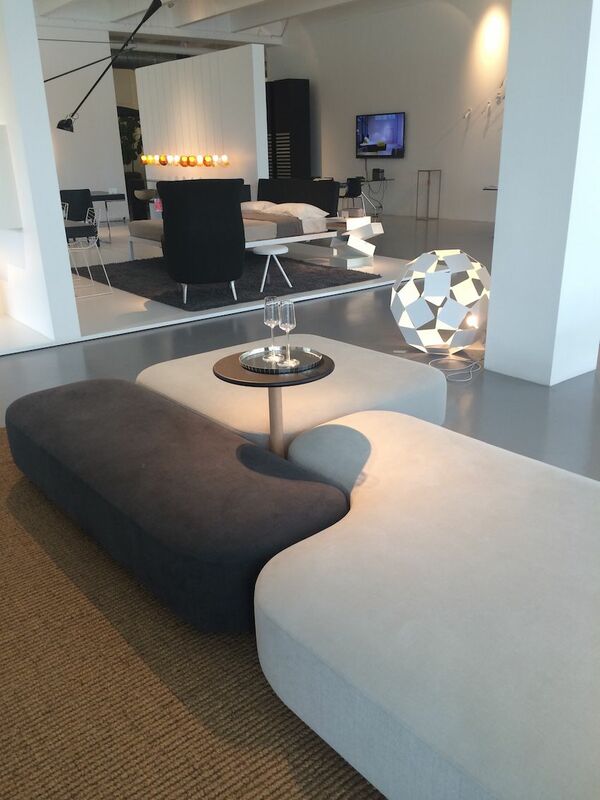 The chic showroom is packed with settings of sleek and classic modern silhouettes as well as on-trend items. A clean and classic marble dining table and chairs are paired with unusual side pieces, like the neon-lit hutch and modern, yet slightly retro, set of pendant lights. Wait, what? That looks like a lamp we usually see on a desk. This giant version is a whimsical addition to the casual living room grouping. 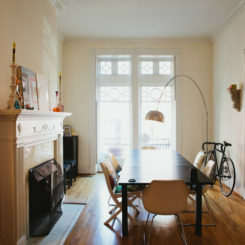 Also loving that fringed rug. 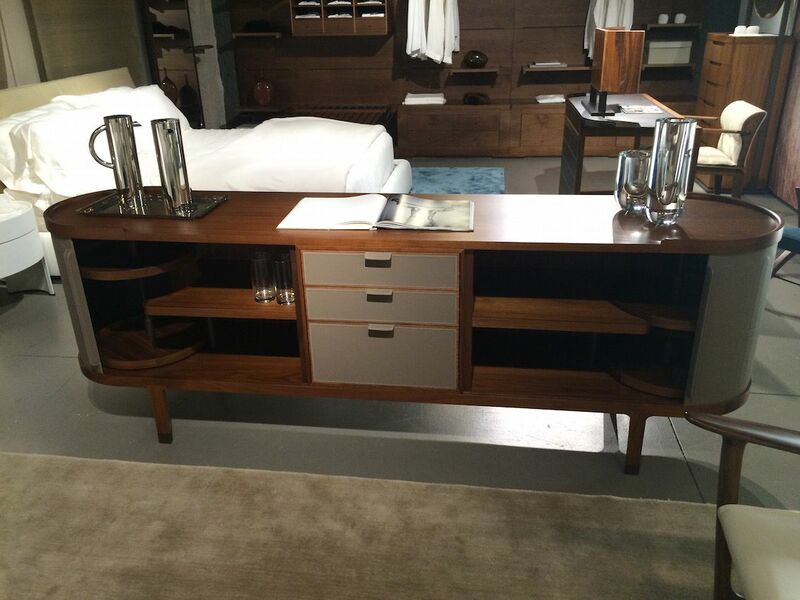 This sideboard with curved ends is striking at first glance, but then I looked a little closer…it has a lazy susan in each end. 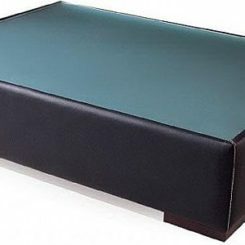 The added piece makes it easy access the items you decide to store inside. 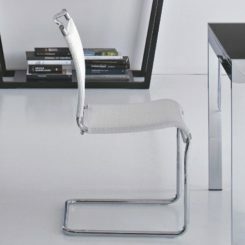 This unusual chair is the Move rocker by . 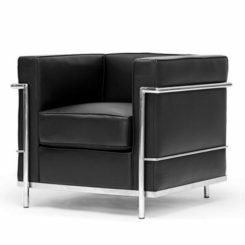 A far cry from the traditional rocking chair, this would be perfect just about anywhere — your living room or a even in modern nursery. 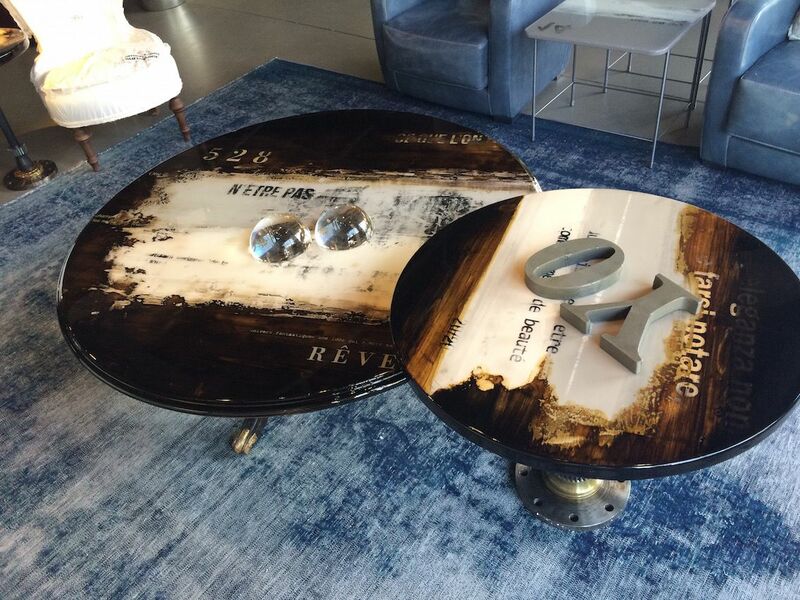 These awesome tables combine an old world feel with a modern twist thanks to the industrial base. 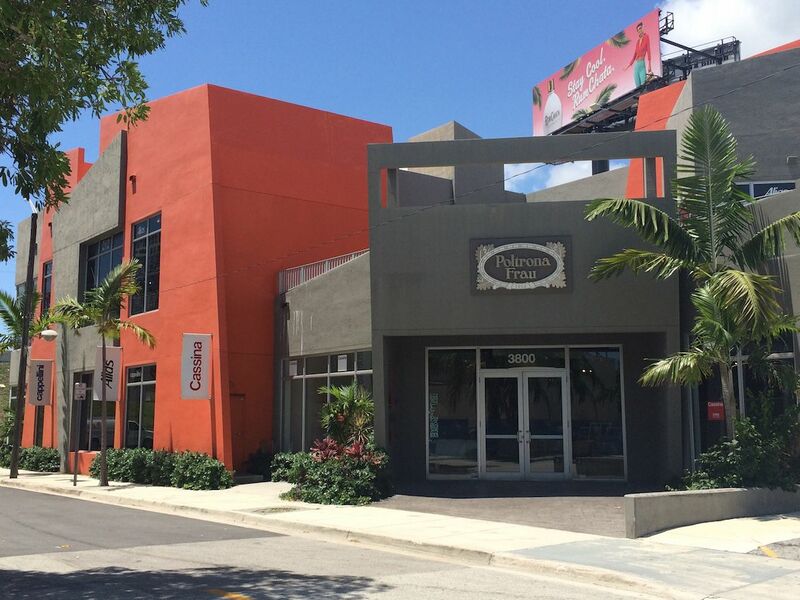 is a single building in the Design District with 20,000 square feet of displays from design brands. 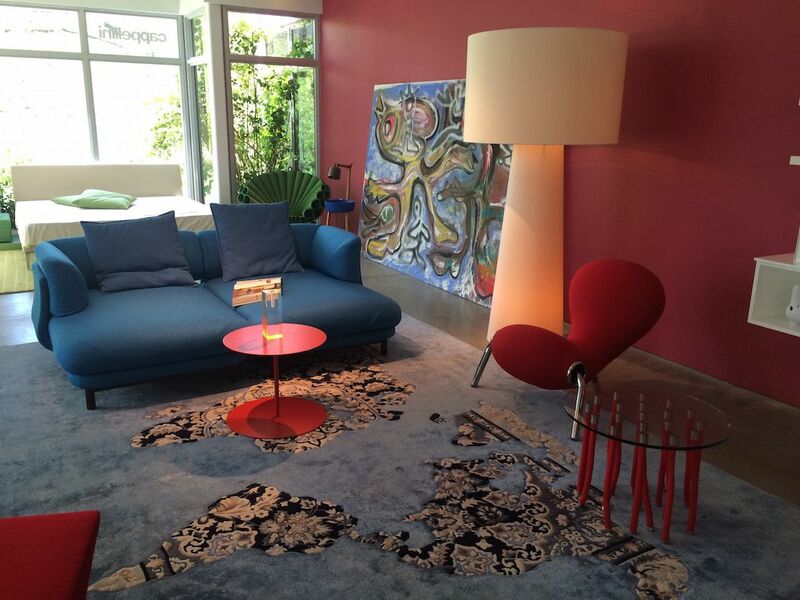 It brings together nearly a dozen brands, including Maxalto, Arclinea, Moroso, Flos and Zanota to name a few. 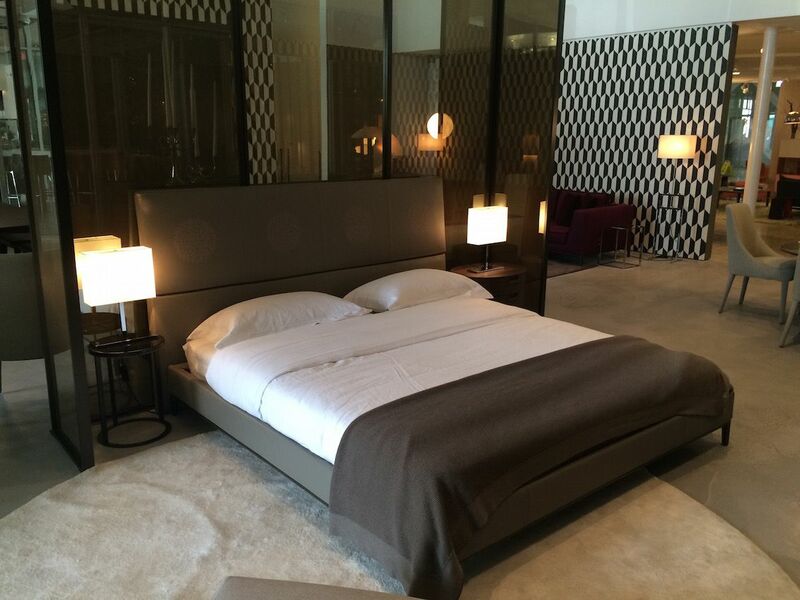 Edel bed is stylish yet warm, thanks to the beautiful fabric upholstery. 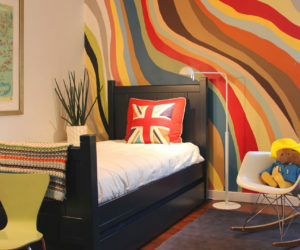 It’s another good example of a modern piece that would fit with any decor style. Lucrezia bed is a real stunner, particularly with the medallion designs in the leather headboard. 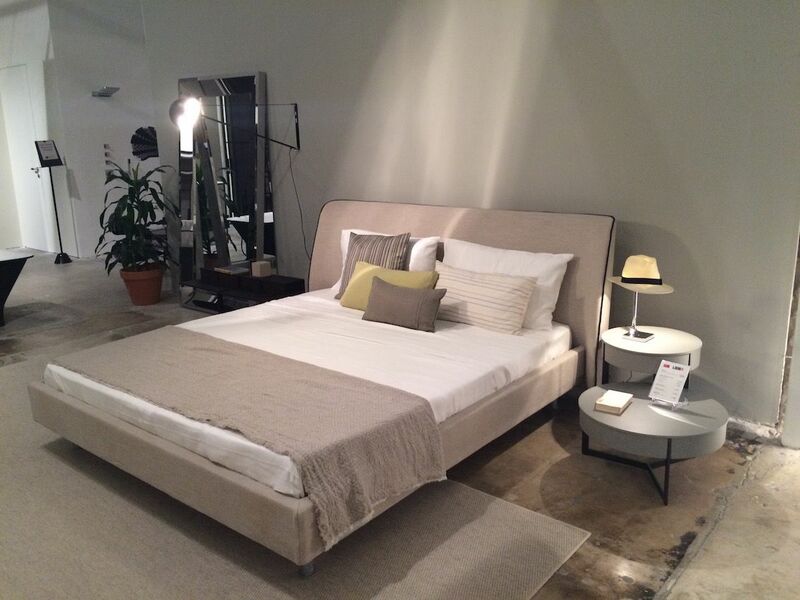 The floating platform is very on-trend and the whole ensemble is enhanced with the square bedside lamps. 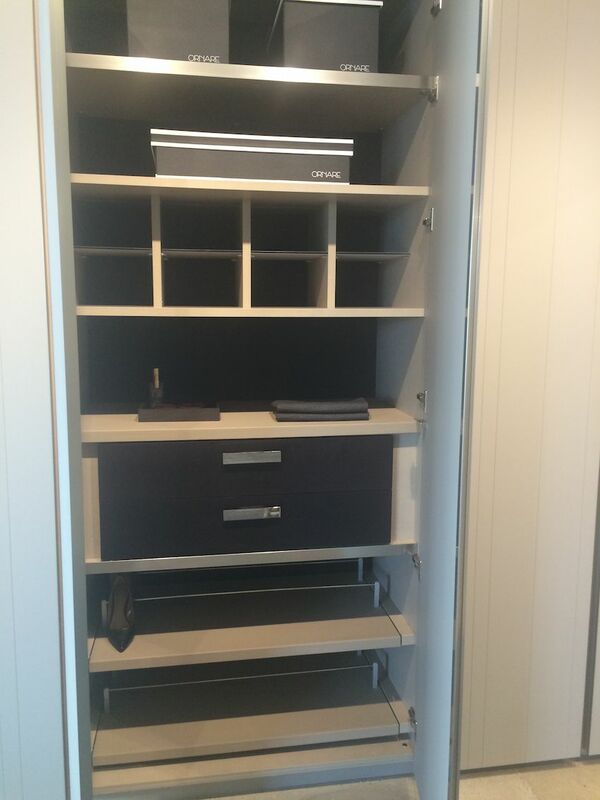 Like many of the design showrooms I visited, Maxalto offers impeccable custom closet organization. 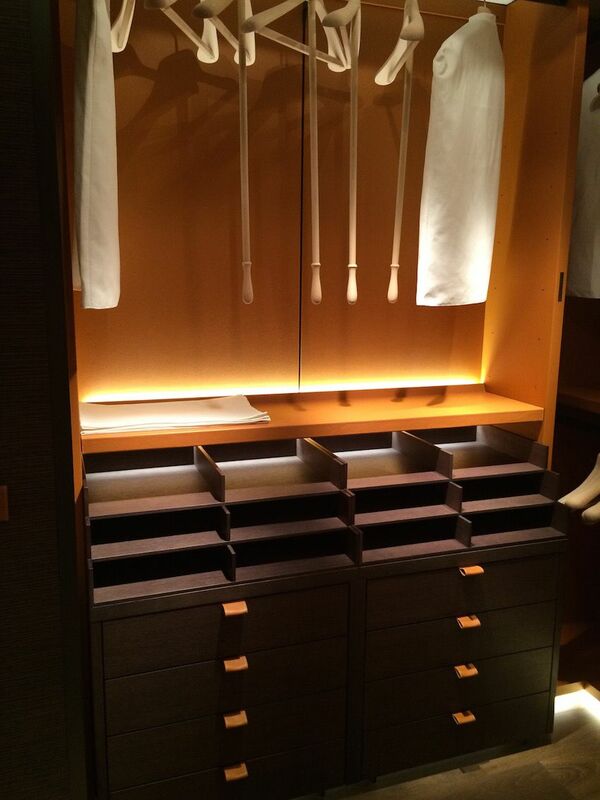 This lighted closet includes leather loop pulls and beautiful divided drawers. This grouping by is casual yet stylish, thanks to the two different shaped coffee tables and the remarkable leather chair with a floral printed back. The layered rugs in complementary colors are a wonderful backdrop for the furniture. 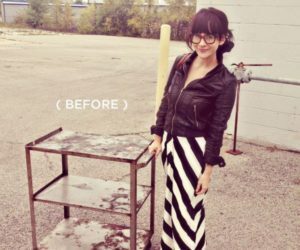 Definitely not your run-of-the-mill patio furniture! These awesome colorful chairs are comfortable and fascinating. The Tim-Burtonish armchair looks almost like a comical throne and the hanging chair makes you want to curl up and spend the afternoon reading. Modern wall hangings like these are the perfect accent to console and chair with ottoman. 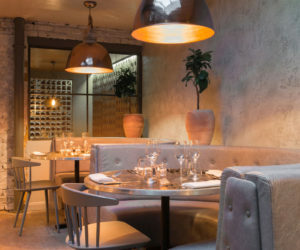 The showroom includes a variety of arresting designs. 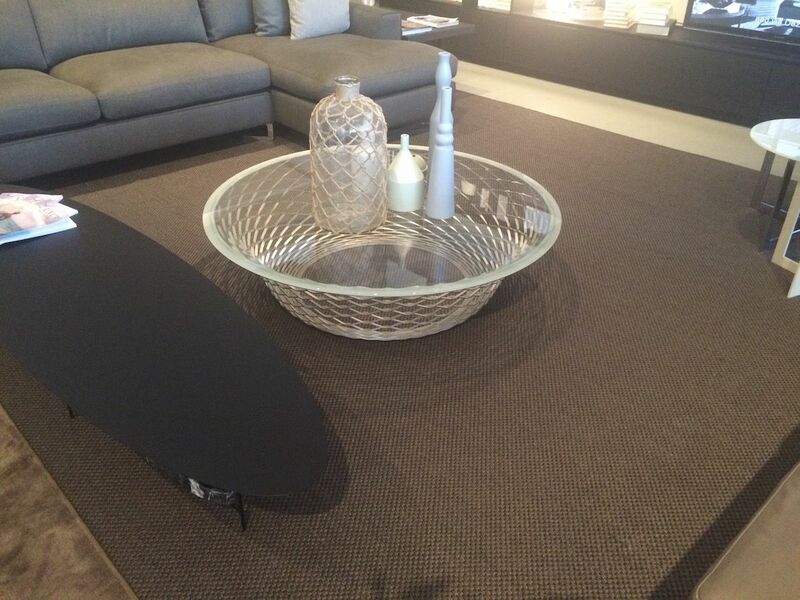 We love the look of this sleek glass table with two metal base pieces. The apple green chairs are a great accent to the grayish glass that would fit in any home. 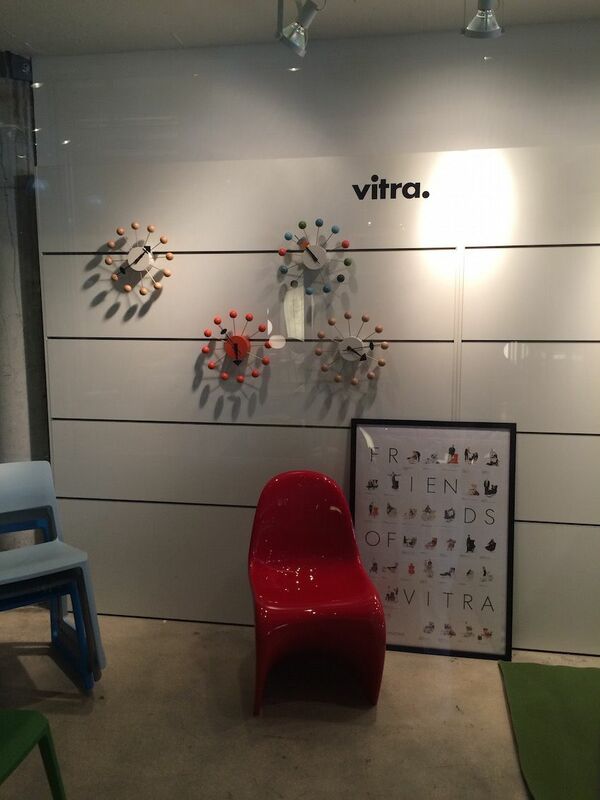 The Vitra display window is so playful with the molded chair and array of colorful clocks. 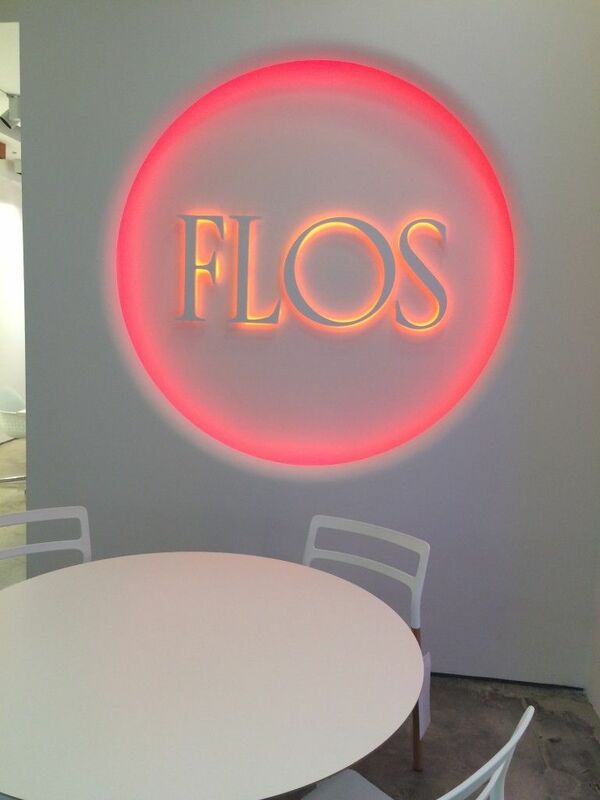 Flos lighting designs are definitely modern. 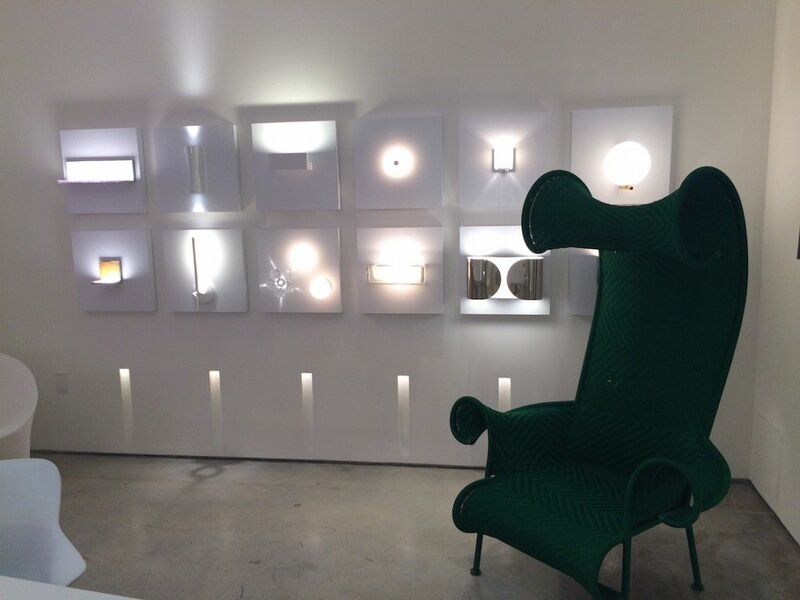 We love how this selection of sconces is displayed in the showroom, as a wall of exciting options. 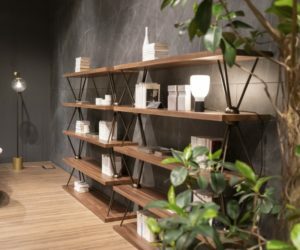 Located in the 4141 building, but an independent design showroom, has a selection of furnishings, accessories and art that are to die for, including some by Vito Selma, a Filipino designer we featured from ICFF earlier this year. 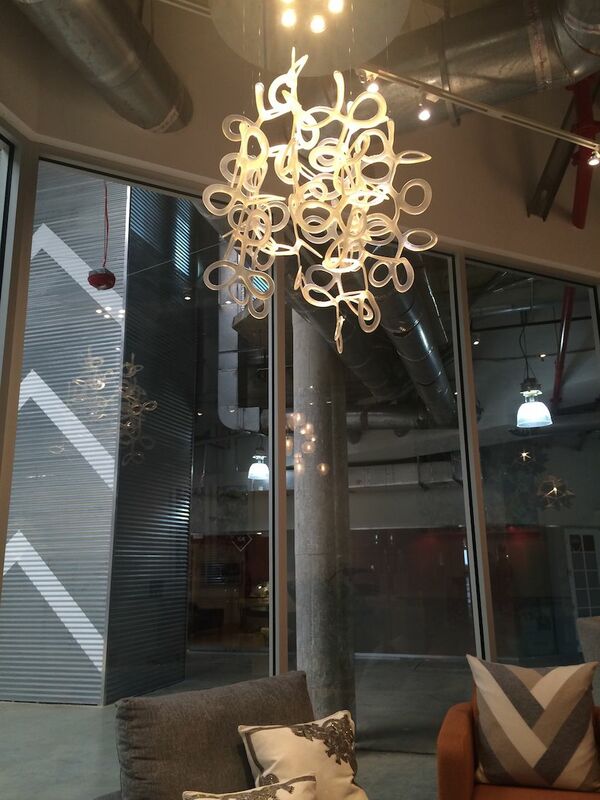 This lucite chandelier is both art and lighting. 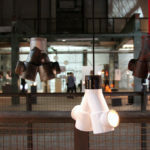 The bulbs from above illuminate the sculpture, creating an exciting atmosphere. 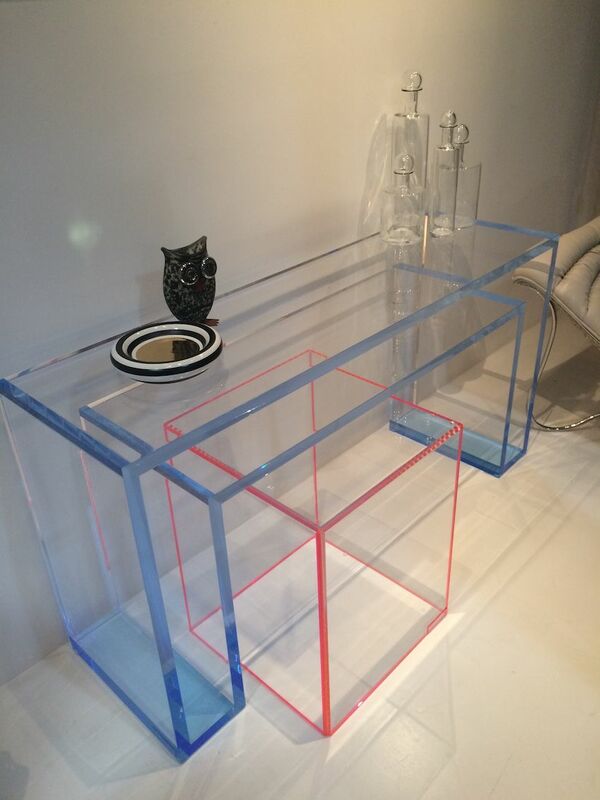 Lucite was a popular material for accessories and accents like these nesting console tables. Perfect for a living room, entryway or bedroom, the colors speak for themselves. 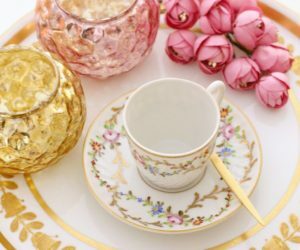 An eclectic collection of one-of-a-kind pieces and special collections, is a treasure trove of unique furnishings and accessories that the owner sources locally and internationally. I’m a sucker for mirrored accents, so I was immediately drawn to this round table, glitzy to its very feet. 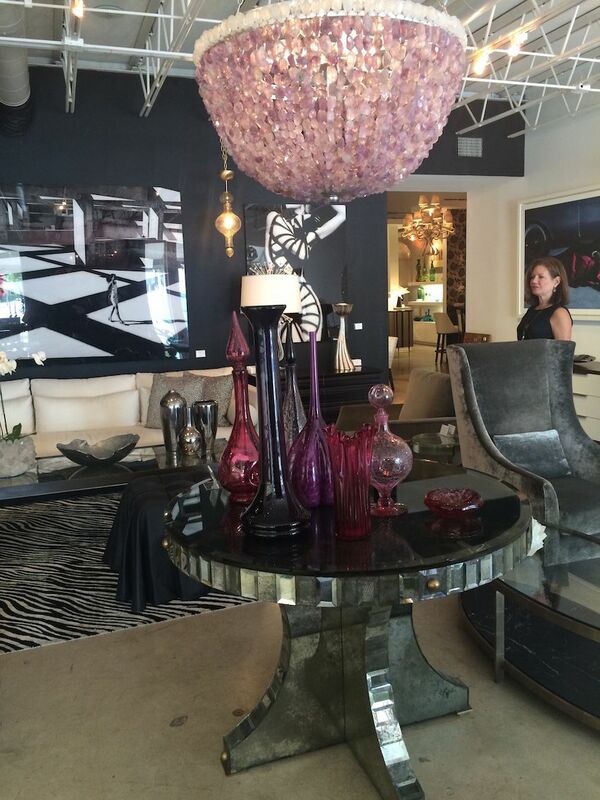 The gemstone chandelier is a perfect companion and the combo left me speechless. 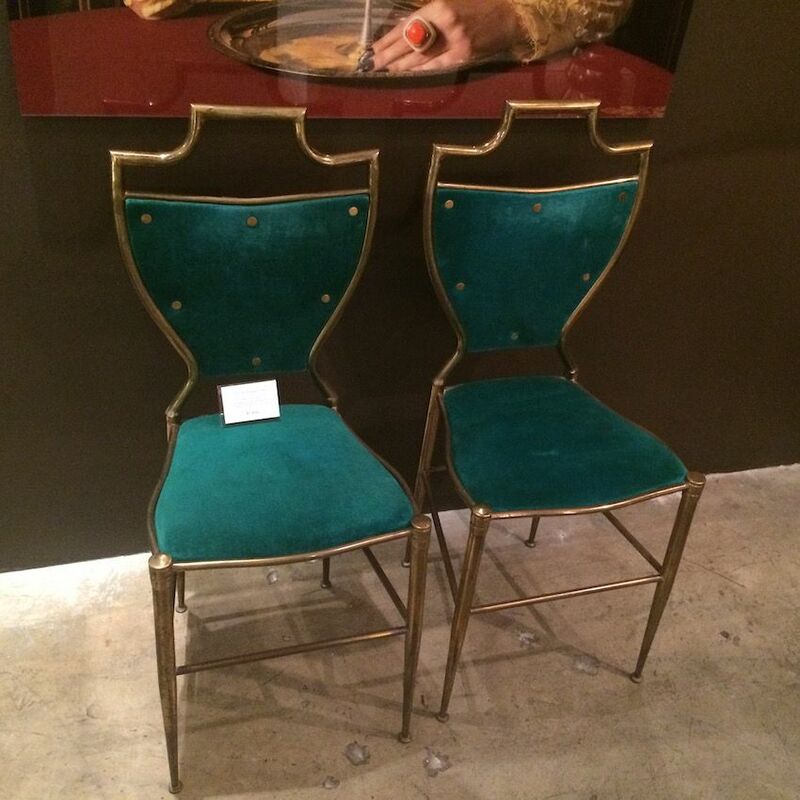 These Italian brass chairs are simple but have noteworthy features: the shaped top, elegant tapered legs and large stud accents on the deep teal upholstered backs. 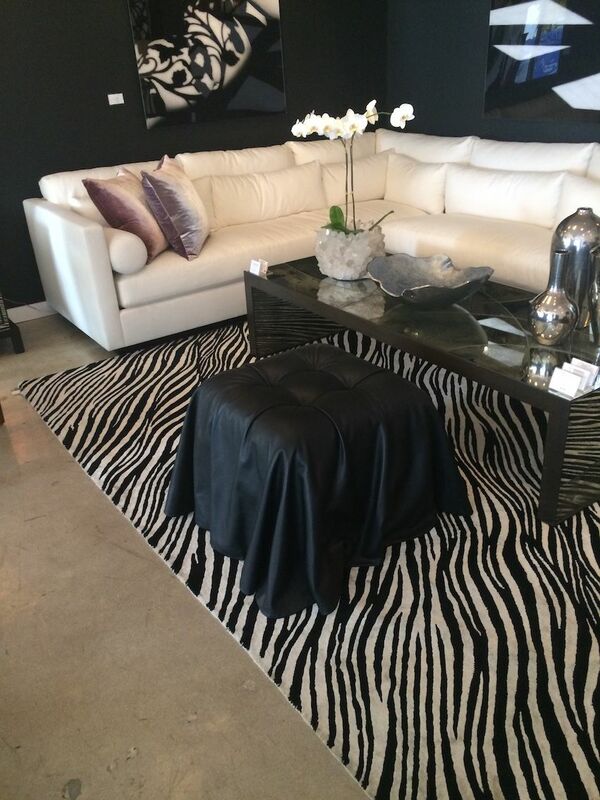 This classic white corner sofa is perfectly parked with the zebra rug, but what really attracts attention is the draped footstool. Stunning! 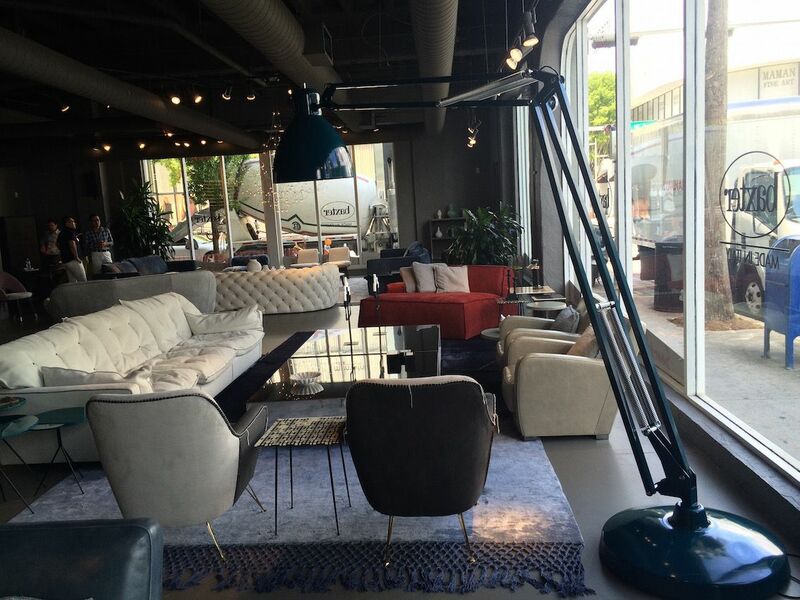 This long-standing company has a beautiful showroom in the Design District. 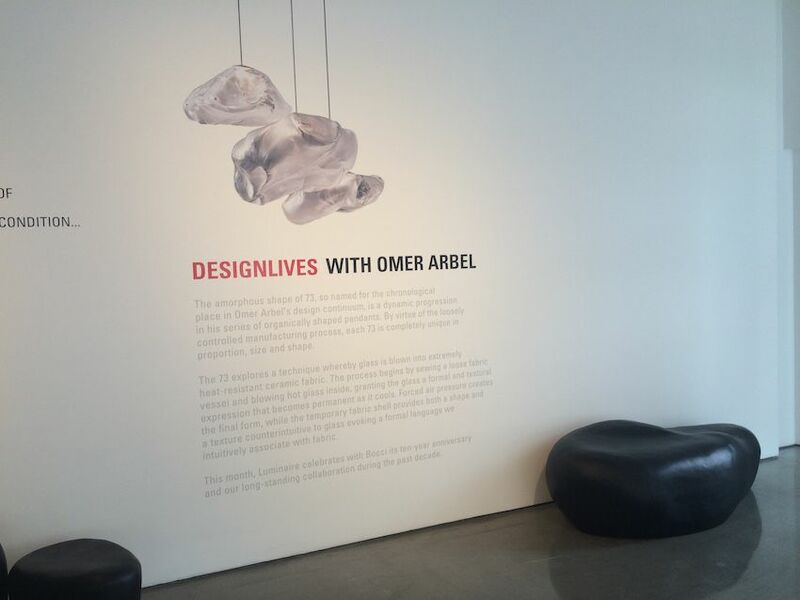 calls itself more than a furniture showroom — “an interactive design research center, a playground for the soul, an esplanade for discovery.” I did indeed discover some great pieces in this lab. 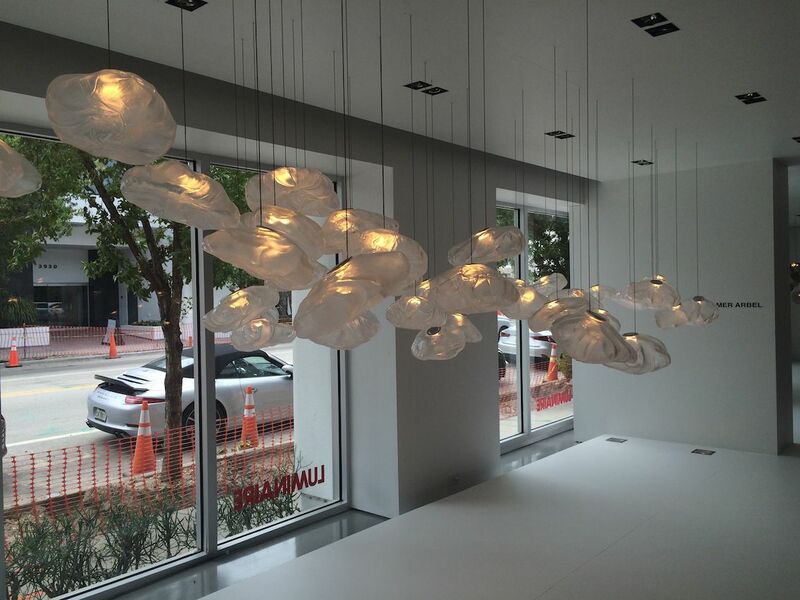 These glass pendant lights by designer and sculptor Omer Arbel are like beautiful floating glass clouds, a bit reminiscent of jellyfish. 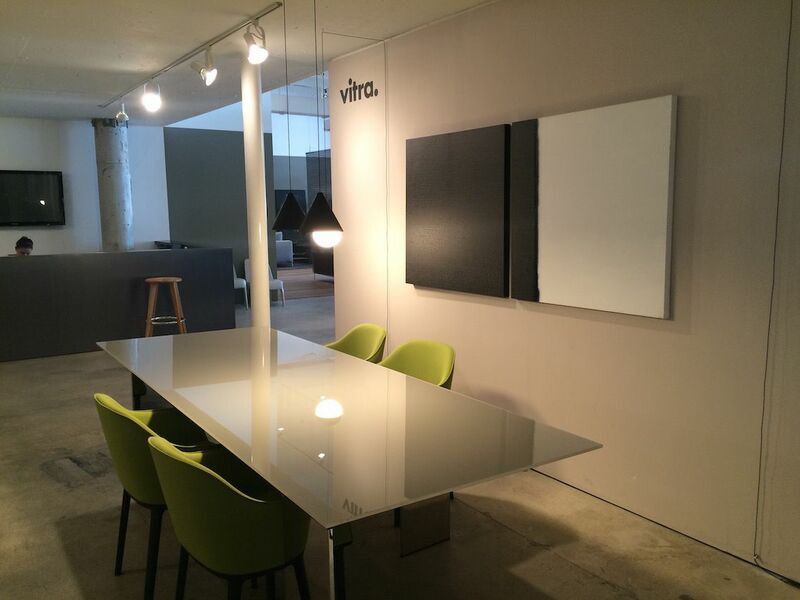 The Common bench is put together in a seating collection around an occasional table. 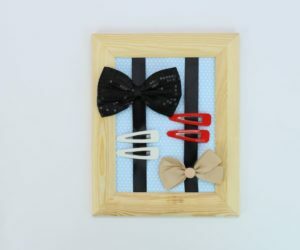 The grouping evokes visions of an elegant cocktail party happening in your living room! 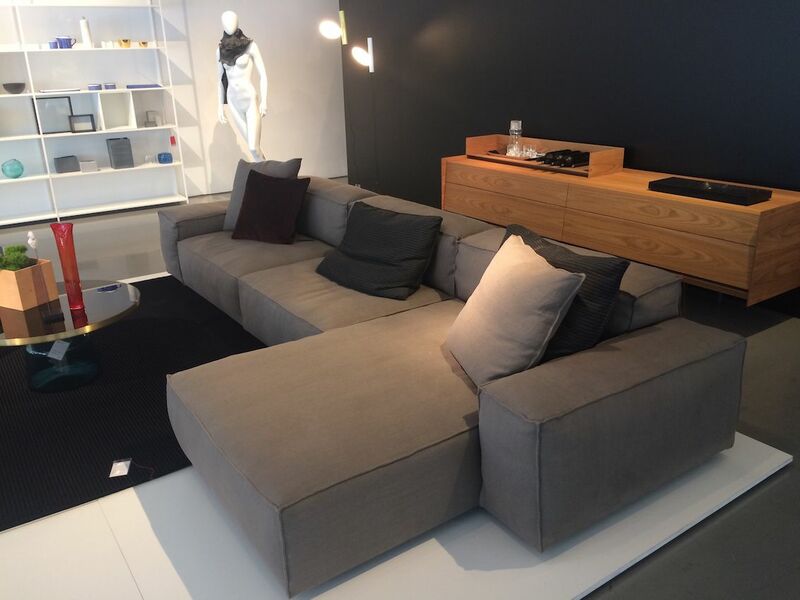 A very comfy looking piece, the Extrasoft Sofa by Piero Lissoni is a hot seller at Luminiare. The sections can be combine in any formation. 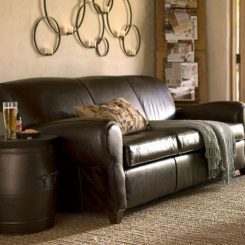 is an Italian company that has made its name in the leather industry and the showroom has plenty of leather. 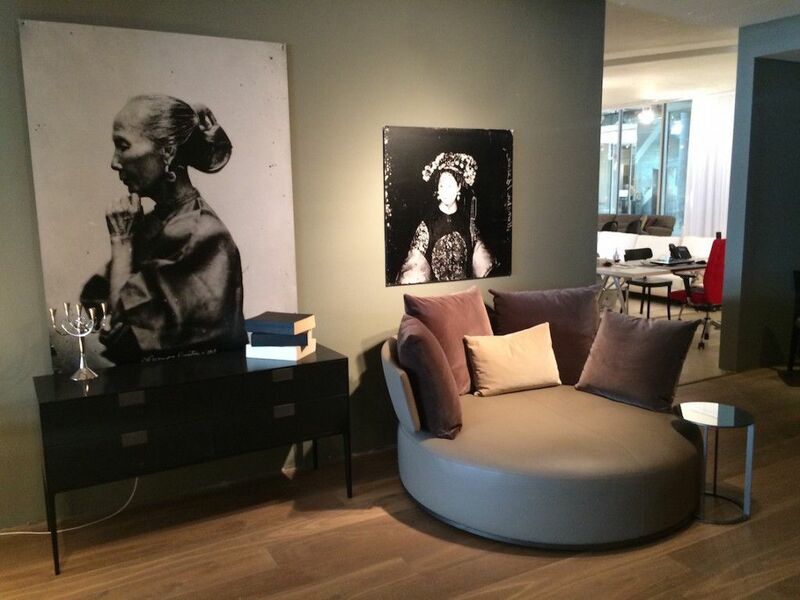 Together with the Cassina, Capellini and Alias brands, the space is shock full of exciting designs. 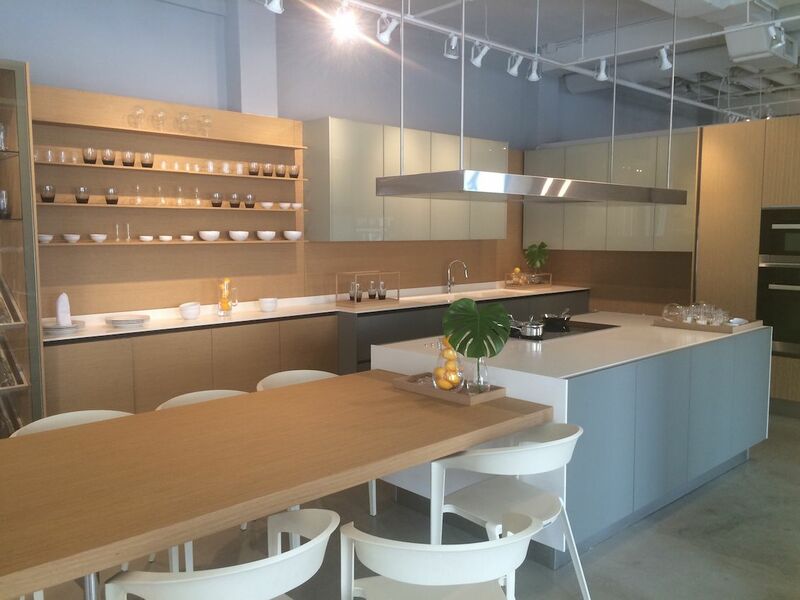 The showroom also represents Tonelli kitchens, which are modern designs with remarkable features. For instance, this kitchen features a refrigerator with doors covered in leather. 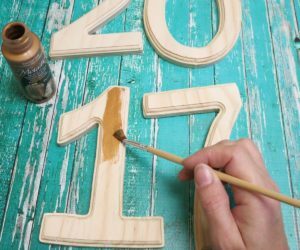 It is actually leather that is powered, mixed with a resin and them stamped with the grain. 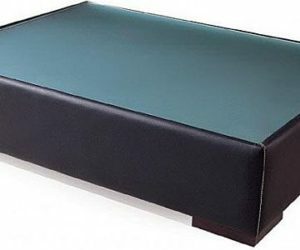 This produces a finish with a genuine leather feel that is still water resistance and easy to clean. Incredibly beautiful. 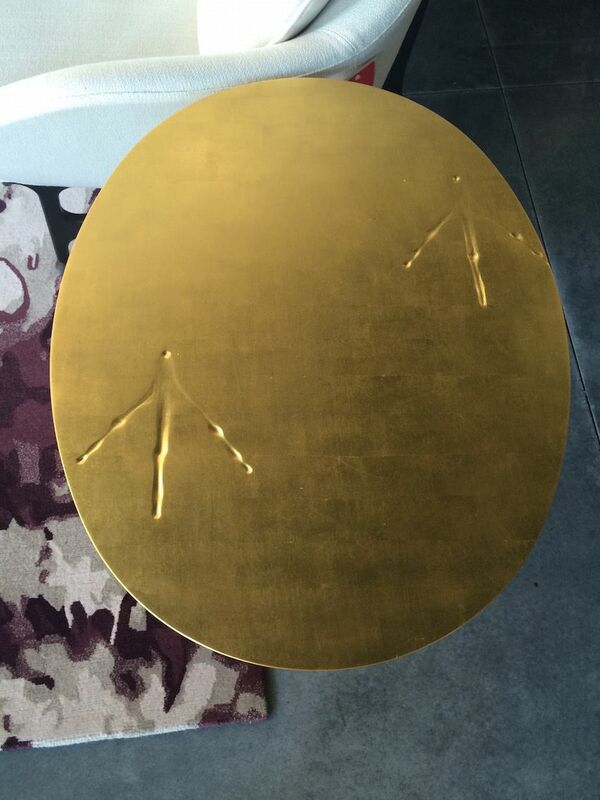 Elegant yet whimsical, this occasional table with bird footprints is by Meret Oppenheim Traccia. So fun. 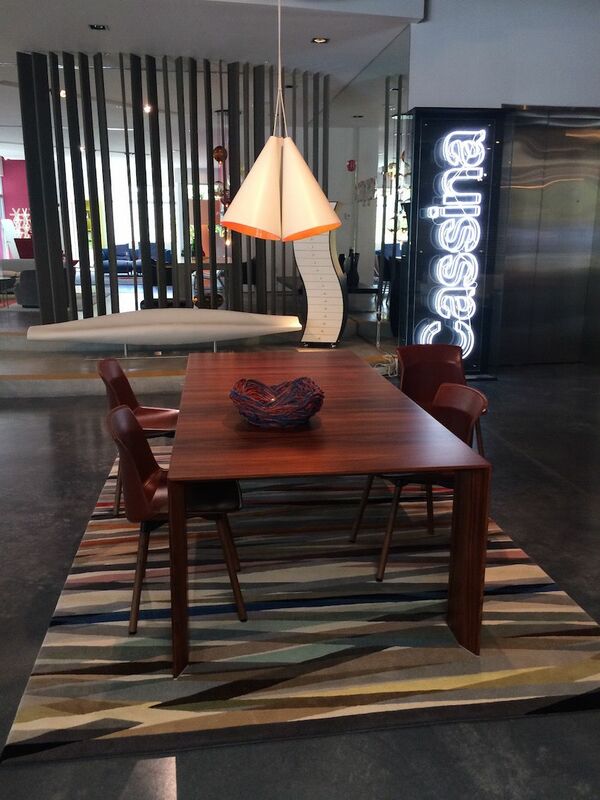 The rich wood of this Cassina dining table set is highlighted by the geometrically patterned rug and mod, orange-lined lighting fixtures. 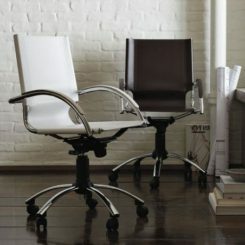 This mod set includes the famous Embryo chair by . We love the rug that looks like it includes fragments of a traditional oriental carpet in an ocean of blue. 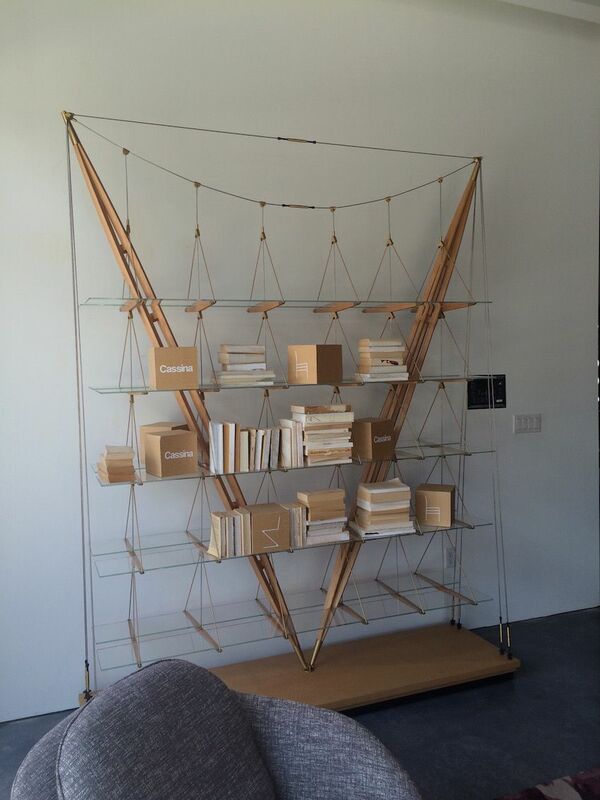 More than just shelving, this bookcase by Franco Albini Veliero is one of Cassina’s reissues of designs by the 20th-century Italian architect. 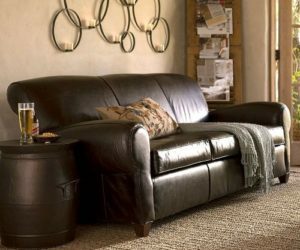 The Chester One sofa is a Poltrona Frau classic. 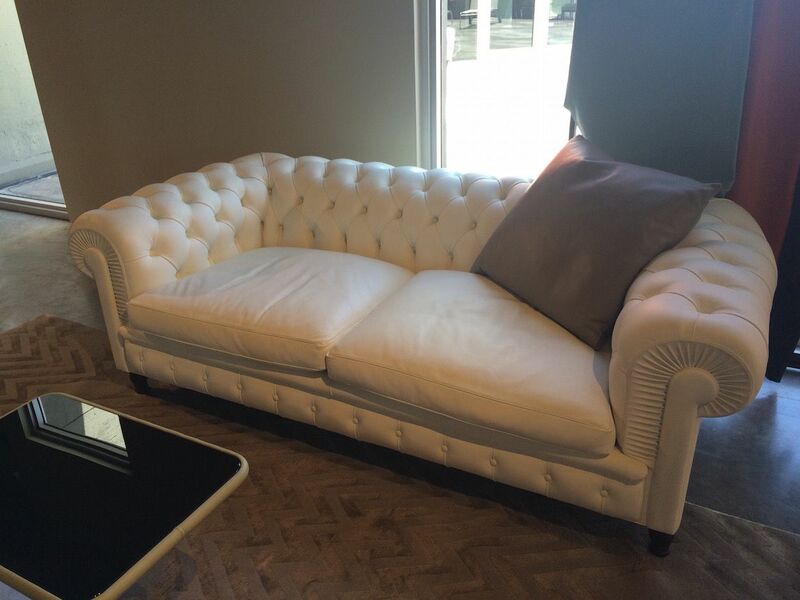 When you look closely at the hand-crafted workmanship of the sofa, you can see why it’s a popular piece. 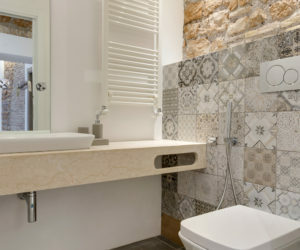 So many design opportunities, so little time! 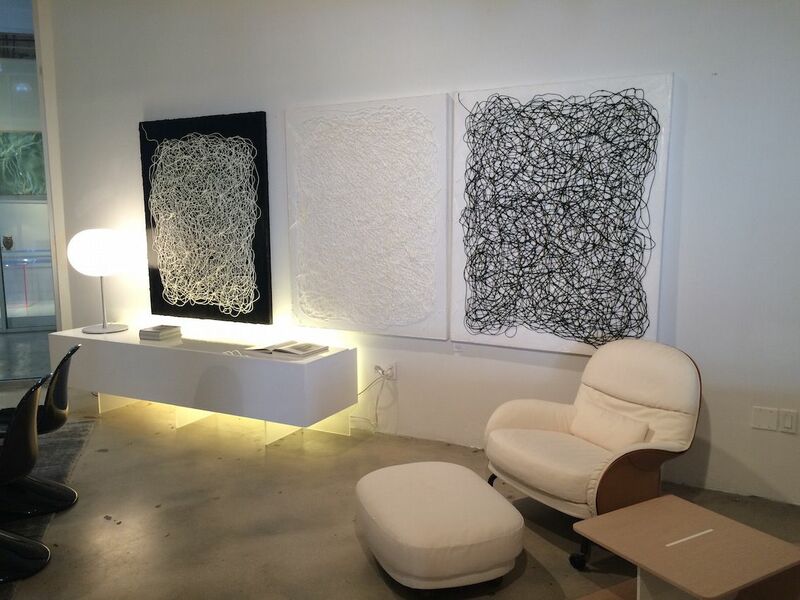 If you’re into design and beautiful things, make sure you allow enough time to explore this fantastic section of Miami.